Feel better? Himalayan salt lamps (there’s one in our picture above) are said to produce negative ions that help clean the air and reduce stress. Do they produce enough of that to clean the air of a large room? I don’t know, but I do know that just the light, the calming orange hue, lights the room with an aura unlike any other lamp we have, and it is relaxing. Now it’s time to take on the adventures of the day. 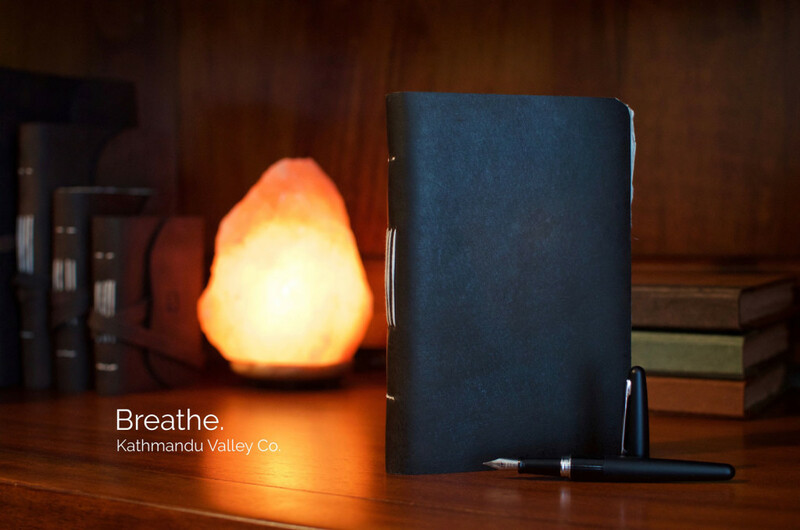 Introducing the Nepali Trekker Leather Vintage Journal by Kathmandu Valley Co with handmade lokta paper. The leather is tanned using the time-honored practice of vegetable dye using black walnut husks which produce a wonderfully vintage look and feel to the journal. The deckled edges (rough cut) of the paper increase the beauty and distinction of the journal. But it’s not just about looks, this is one tough journal. Made in Nepal from cuttings of Lokta bushes, the paper is unique, textured, and full of rough edges. The cuttings of the lokta bush are taken from between about 5,000 feet and 13,000 feet in the Nepali Himalayas. The bush regrows in about 5 years creating a renewable source. The inner bark from the lokta bush is stripped by hand and cooked into a mash in the rural villages high in the mountains. The pulp mash created is then applied to boxed screens and set to dry in the Himalayan sun. Pack animals carry the finished sheets down the mountain passes on a multi-day trip, and the paper eventually reaches Kathmandu, the capital of Nepal where the paper is hand sewn into our journals. To arrive in your hands, the Trekker Journal has made a lengthy journey through the Himalayas and across oceans, starting the trek for you. Where will you take yours? Capture your adventures, treks, or simply your thoughts about life as you sit back in the calm light of a himalayan salt lamp. Namaste. 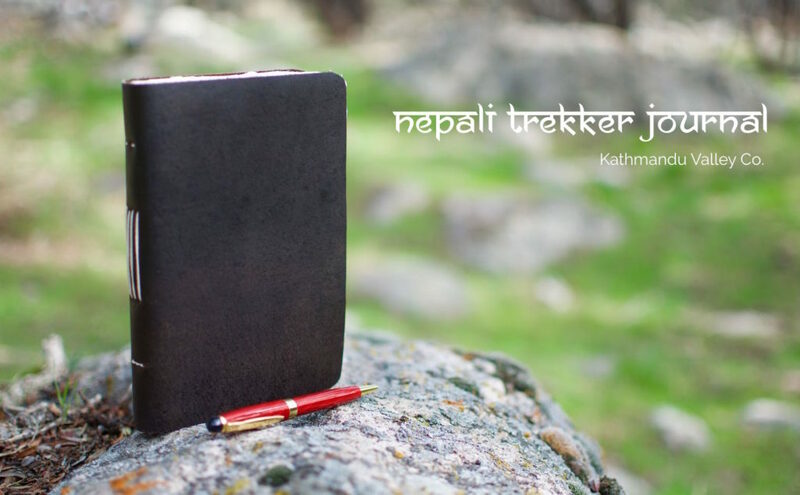 View our Nepali Trekker Leather Journal here.